Summer is here and your Muscogee Roller Girls are kicking it off right with a yummy fundraiser! Boston butts for only $20, what!? This fundraiser will be helping MRG with purchasing jerseys for their first ever HOME TEAMS! The Sin City Phoenix & the Fountain City Rapids. Yep, thats right, even more derby action coming your way from MRG! Orders are due June 12th, 2017 and pickup day will be June 17th, 2017. 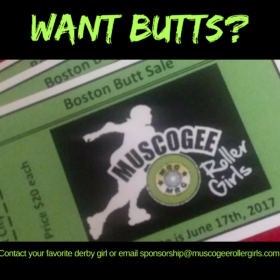 Contact your favorite derby girl or email sponsorship@muscogeerollergirls.com to purchase your butts today!